I don't know about those two, but last week i bought a job lot of queantum leap books (8 in total) for ?16, so only ?2 a book. 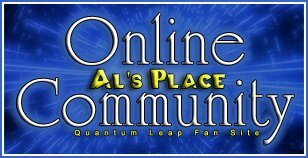 I found a lot of inconsistances with the writers, maybe they should do their quantum leap homework. Yeah, it's really annoying. Everytime i read something that it just really goat my goat! You'd have thought if someone was going to write a book about an existing cult favourite you'd do your homework. The other two books you mentioned are better than The Wall in my opinion. I never did like The Wall as a Novel. I don't like Ashley McConnell's novels. I can never get past the fact that she only has Sam's mind leaping and not his body. But, in her defence, she wrote her first book BEFORE the show defined that it was actually Sam's body leaping. So she had to make a choice early on wether to make it Sam's mind or body. She chose mind. I will resurrect an old thread. Considering the last post was by a Tom... It seems right another Tom will make the next one! I just read Prelude. SPOILERS!!! While I liked it in the beginning its seemed to lose my interest towards the end. The problem was the conspiracy to take over Project Quantum Leap. The are no resolutions for the conspirators. Sam Leaps...and those characters fates are left hanging. With the start of the Pilot rewritten to suit the book! The development and creation of Ziggy I liked a lot. Sam using his own brain tissue and nerve cells from Al to create Neurochips makes sense. Explaining how Ziggy is connected to the two. How the Project is able to communicate with Sam. Also all the probabilities involved in Time Travel. In order to travel in time you would have to map it. But that leads to my other problem with the book. Sam's time Traveling seems to be a mistake. While the show presented it as if the mistake was that they could not control Leaping In the book Sam thinks he is only creating the Imaging Chamber. The Accelerator Chamber is only mentioned in passing until the end. Without any details how whats its function was to be in Sam's original plan to just observe time. I am still glad I read it though. The characterization of Sam and Al were perfect. I would had like to seen the story start with their first meeting at the Star Bright Project. Last edited by Avilos; 05-25-2009 at 02:58 AM.